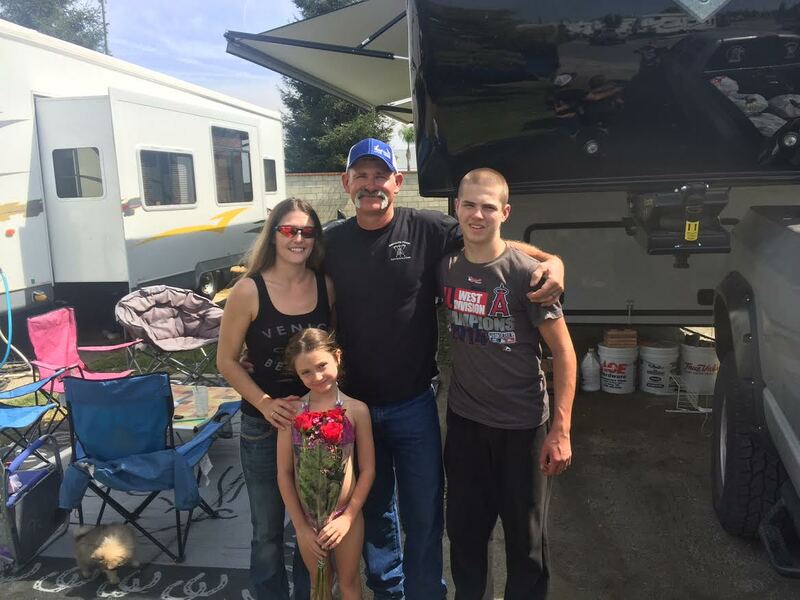 Our thanks to the Kalinoski family for donating a travel trailer to BYI! Hi, we are the Kalinoski family! A little about our lives: Jeff is a Journeyman Lineman, traveling around the country building and repairing power lines. We feel God made us a family for a reason, and in order for us to stay as a family unit, the children and I travel with him. We have a sixteen-year-old son, Jared; a seven-year-old daughter, Bailey; a ten-year-old dog; a 2-month-old puppy; and a fifth wheel that we live in. We have set it up with toys, clothes, school supplies, and all of life’s “stuff”. I stay at home with the children, homeschooling them and taking care of the house and “life” as Jeff goes out to help ensure everyone’s power stays on – we all love our power! We have met many wonderful people along the way, and have been to many states: Washington, Oregon, California, Montana, Utah, Nebraska, Colorado, and Arizona, just to name a few. We have explored many beautiful sites in the places we have been: some man-made and some straight from God’s hand. Our children have been able to experience life, see many great places, and have made friends from all over the country. We absolutely love our lifestyle and feel very blessed to be able to travel around seeing and experiencing our great country. We are firm believers that what we have has been given to us by God – from each other, to our children, to our belongings and jobs. We are very thankful for all He has blessed us with, and feel that we need to bless others with God’s love the best we can. We donate our belongings that we no longer need to someone who can use them; as a family, we have done community service together, and our children have both been very involved with community service and even mission work. We have always strived to teach our children what it truly means to be a Christian, encouraging them to put God first and be willing to help others when they can. Out of all the states and places we have been, the Gorge area has made the most impact on us, individually and as a family. It is not always easy to find a church family when you travel around, but God definitely had a hand in putting us in the Gorge. We enjoyed the area; it is very beautiful, and is also close to where my husband and I both grew up, Spokane, making it easy to visit our families on a somewhat consistent basis. However, hands down, the best thing about the Gorge area was the family we came to know at Calvary Baptist Church. Quite a few months ago, Pastor Jeremiah sent us an email about Bless You Inc. looking for fifth wheels and Pete’s (a BYI partner) contact information. We kept it, not completely sure why, since at that point in time we had no plans of purchasing a new fifth wheel. Obviously, God already knew we were going to be making that purchase. Pastor Jeremiah probably figured we knew quite a few people with fifth wheels, and may have an idea of used fifth wheels for Bless You Inc. As we kept our eyes and ears open and spread the word, it seemed no one was in the market for a new fifth wheel, but we kept the email and we kept looking. Little did we know, God had planted a seed of donation within our hearts once again. Our family has always had a soft spot for people who are going through a difficult time. I have generations of military veterans in my family, one who’s even been homeless at times, and it always touches us when we see a vet in need of help. My mother’s family had lost their home when she was a little girl due to a fire, and it still saddens all of us when she speaks of it. We have friends we have known for 16 years who just lost their home this past Christmas due to a fire; they are still cleaning up and in need of prayers. One of Jeff’s callings in line work is storm work – he loves to be able to help turn people’s power back on after a major storm has come through. From ice storms, to fire storms, floods, tornadoes, and even hurricanes, Jeff has helped with storm power cleanup and restoration across the nation. So we have seen firsthand how these unexpected events can completely uproot lives, leaving people without even a home, and it can take months and sometimes longer for people to get back on their feet. 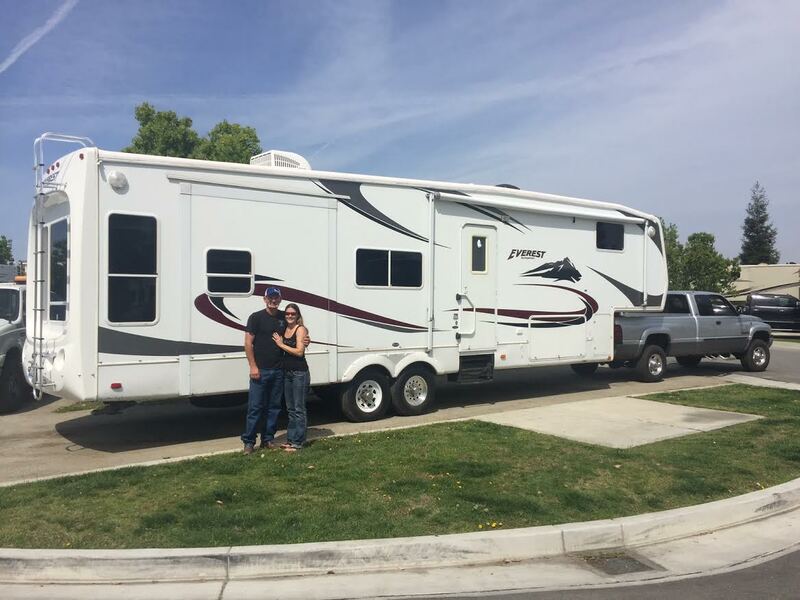 When we decided to purchase a new fifth wheel for our family, it was a long process of trying to decide what to go with – but the funny thing was, there was always one question that kept coming up from everyone: What are you going to do with your current fifth wheel? Our answer was always the same: We don’t know. As the time got closer for our new fifth wheel to arrive, we still didn’t know what we were going to do with our current one. We had a couple people ask us about it and make an offer on it, but for some reason it just didn’t seem right. So we talked about it and prayed about it and thought about it, and that’s when that email that Pastor Jeremiah sent me came to mind. So I emailed Pete, introducing ourselves and asking him what exactly this Bless You Inc. was. We knew right then and there what we were supposed to do with our fifth wheel. When Jeff came home that night and asked about my day, I read him Pete’s email and told him I thought it was really neat, and then we were on to how the rest of the day went, kids, work, etc. A couple nights later, we had a few of the guys Jeff works with over for dinner. It is a pretty regular occurrence to have a couple extra mouths to feed, as most of the guys’ families stay home and do not travel with them. 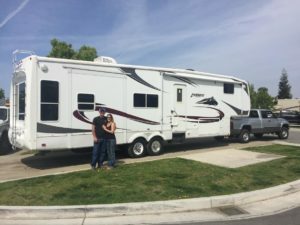 One of them asked us, yet again, what we were going to be doing with our fifth wheel, and without hesitation, Jeff said, “We’re donating it,” and then looked at me with a grin. We never discussed it, nor did we need to; we both knew what God wanted us to do with it! This also gave us a great opportunity to share God with the guys who were having dinner with us! 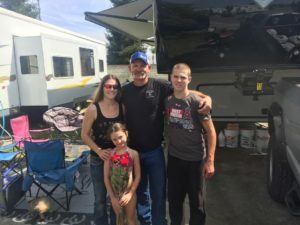 I emailed Pete the next day and told him that we would like to donate our fifth wheel to a family that could use it – and the rest is history! We feel very blessed to be able to share God’s love with Bless You Inc. and those people’s lives they touch.